Out of all the white grape varietals in the world, none are more widely planted than chardonnay. And if you think about it, it makes sense, right? I feel like the shelves of wine shops all over the world runneth over with chardonnay. Open the fridge of any suburban family and you’re likely to find a bottle of it. Every liquor store in town is going to carry it from at least five producers, and chardonnay always seems to be a wine that people find early in their wine drinking lives. Often chardonnay gets a bad rap. I think this is because there is just so much of it produced. Unfortunately, with almost 500,000 acres of chardonnay planted around the world, there are more than a few bad bottles floating around. So what makes chardonnay so awesome? As with all grape varieties, place matters, but this is especially evident with chardonnay. The smell and taste of golden apples are present in almost all chardonnays, but the additional notes vary wildly based on local climate. Chardonnay from warmer climates, like Napa Valley in California or Australia can be almost tropical, with notes than can include papaya, mango, and even pineapple. On the other hand, cooler climate chardonnays skew more towards Granny Smith apples, lemon, lime, and chalk. You’ll find those flavors in chardonnays from Oregon, Washington, and some cooler parts of both California and France. Just like flavor, the acidity of the wine also depends on climate. A higher growing temperature will result in a lower acidity wine, while cooler climates result in higher acidity.The same can be said for alcohol content, as well. Just as there is a duality in the chardonnays that grow in warm versus cold climates, chardonnays can also be roughly divided by their texture. As we talked about in our post on tasting wine like a sommelier (click here if you missed it! ), texture is the way a wine feels in your mouth, and chardonnays are generally either quite light and crisp or rather heavy and creamy. The reason for this in addition to climate is the introduction of oak to the wine. Oak imparts a totally new set of flavors into the wine. We talked a lot more about oak aging in a blog post here, but the tell-tell signs of oak are flavors of butter, toast, dill, and coconut. It isn’t the oak aging itself that can make the wine feel thick or creamy. This texture is caused by a process called malolactic fermentation, and it can happen in any storage container, from oak barrel to steel tanks. Malolactic fermentation is the process of yeast cells transforming malic acid (the sharp acid in apples and lemons) into the softer and rounder lactic acid (the same kind of acid as in milk). In a side-by-side comparison, the transformation is striking and adds another layer of complexity to many wines. 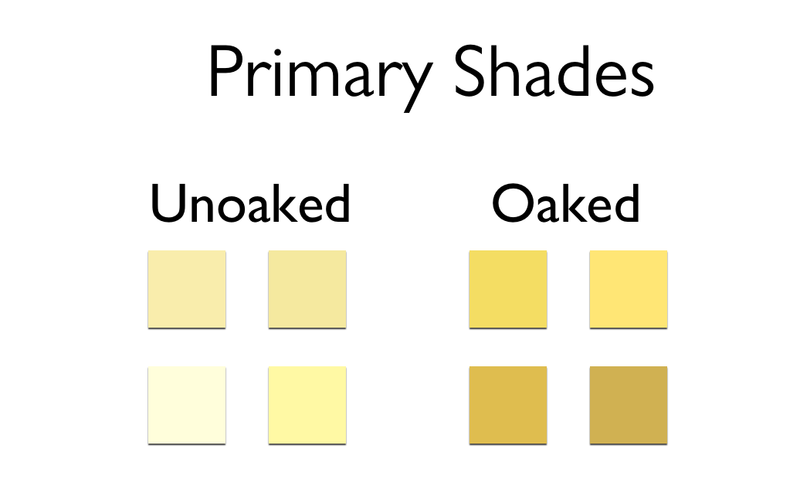 A good “rule of thumb” is that unoaked chardonnays will be lighter in color, more like straw or pale yellow, while oaked chardonnay will take on a deeper yellow, almost golden hue. 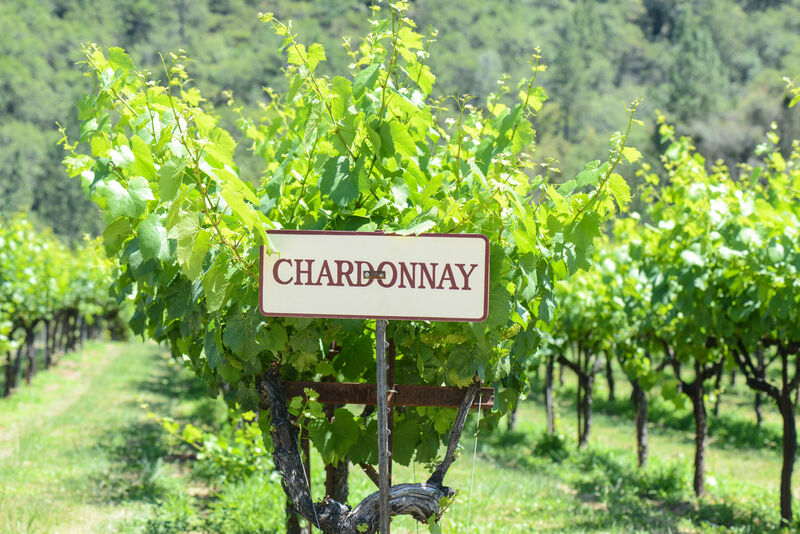 You can find excellent examples of these creamy, well-oaked chardonnays from all over the world, but some of the come from places like Napa Valley, Australia, northern Italy, the Burgundy region of France. Unoaked, crisp wines can also come from anywhere, with many notable producers in the French region of Chablis in Burgundy, Oregon, France’s Loire Valley, and New Zealand. As I said before, chardonnay is incredibly versatile, it can be transformed into almost endless expressions through different winemaking techniques and practices. Two of the most common are as a sparkling wine and as a blending grape. Chardonnay is the workhorse of the three grapes that make Champagne: chardonnay, pinot noir, and pinot meunier. A Champagne made only of chardonnay is referred to as a Blanc de Blanc, or essentially “white of whites.” A Blanc de Blanc can be made anywhere in the world, and the grapes for these wines are often the first to be harvested so that they don’t get too ripe and lose their natural acidity.These wines are ridiculously good and get even better (think more creamy and nutty) with age. As a blending grape, chardonnay can take on an entire rainbow of additional flavors. You’ll commonly see it blending with grapes such as sauvignon blanc in France’s Loire Valley, or with viognier in warmer climates. In cooler climates, it often blended with riesling for additional aromatic notes. In California, some winemakers are even experimenting by blending it with semillon or even moscato. For cheese, the softer the better, both goat and cow’s milk will be fine. White meat, like chicken and fish are your friends. The more golden the wine, the heavier the food. For a well-oaked California chardonnay, try something heavier like a corn chowder or pasta in an alfredo sauce. For a light chardonnay like those from Chablis, stick to a class pairing like oysters, scallops, or fish. Bubbles help cut through salt, so pair your Blanc de Blanc with french fries, fried chicken, or other guilty pleasures. ‘Sangria’ has become synonymous with ‘wine punch’ for most people, but it actually holds a specific place in beverage history. 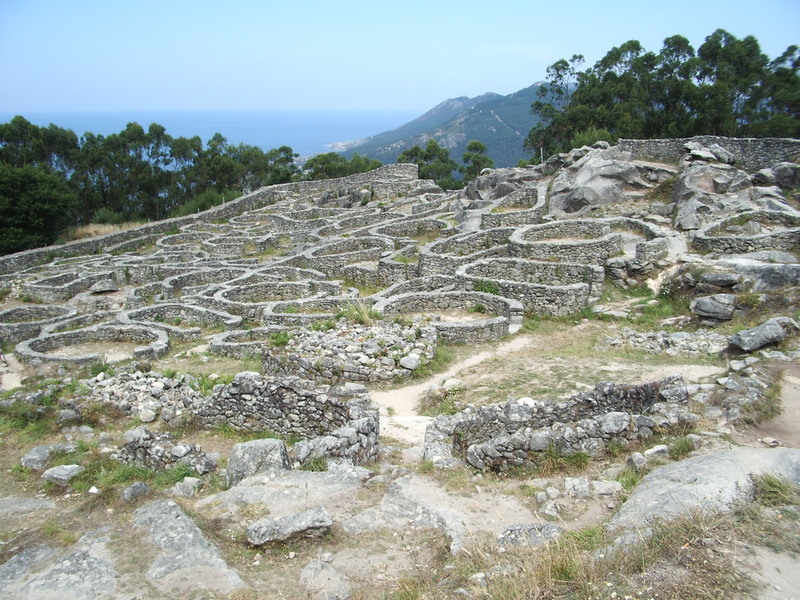 Around 200 BC, the Romans swept through the Iberian peninsula, planting vineyards as they went. Historically, wine was added to water to kill any bacteria and make it safe to drink. 2,000 years ago, however, winemaking wasn’t the skilled art that it can be today. Herbs and spices were added to hide any off-putting flavors in the wine. Eventually, even after potable water became easier to find, the custom was so popular that it began common for people to make their own blends of red wine and herbs. The Latin root of the word ‘sangria’ is sanguis, or blood. 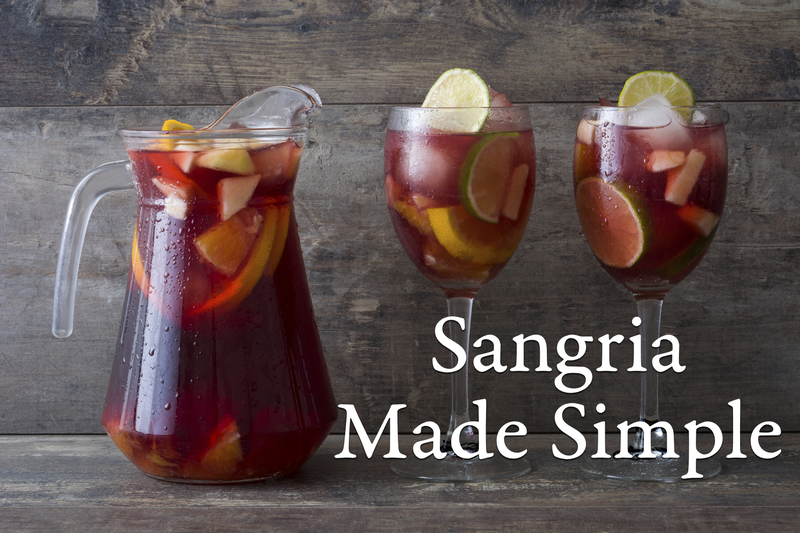 Today, making your own delicious sangria is easy, so long as you follow a few simple steps. I’m going to cover a white and red sangria, as many people have strong feelings on which is better. So, red sangria. The most common question I hear is “What type of wine should I use for sangria?” The short answer is any wine that you like. Sangria has no rules. The long answer is that you should consider what flavors you will be adding and pair accordingly. Something from Spain- maybe a Rioja, would be a wonderful traditional base for sangria made with brandy, orange slices, honey, and lemon juice. If you are making something more rich, maybe adding pomegranate, rum, orange liqueur, and blackberries, a cabernet with more tannins would stand up to these strong flavors. If you are thinking strawberries, raspberries, and rose water, a lovely pinot noir should work nicely. While it may not be the traditional choice for sangria, white wines create delicious, refreshing drinks for the summertime. Lighter and more tropical fruits are easier to use in this version as well. If you like sweet wines, moscato makes a great sangria. Peach nectar, raspberries, and strawberry would be a great combination of fruits for this wine. If you like something more crisp, use a sauvignon blanc. I’d use basil to enhance the grassy flavors of the wine alongside pineapple, watermelon, and a touch of elderflower liqueur. You’ll want to use a wine of reasonable quality, but there is no reason to break out the good stuff for a good batch of sangria. Let you sangria sit for a bit after assembling. Preferably overnight- covered and in the fridge. If you add liquor to your sangria, you will be fortifying it. If you want to be able to sip on it for a few days or it will be sitting out for a period of time, this is a good idea. This is a premium idea for when you have lots of random wine to get rid of or someone sends you and over-large fruit bouquet. Taste as you go. Yes, the flavor will change as it marinates, but in general, this is a trial and error type of creation and you can always add more stuff. In Spain, sangria is often served over ice and topped with soda water. In the Arkansas heat, this is probably a good idea. Wait until the sangria is in the glass to add the soda water- keeps it fizzy. As far as stemware goes, it will look great on Instagram if you serve in wine glasses with colorful, fresh fruit to garnish. If you don’t participate in this silliness, anything from fine crystal to solo cups will work. If you don’t have much time to let your sangria sit, choose fruits that are soft and/or porous. I’ve seen watermelon turn a white wine pink in 10 minutes flat. Also, in this case, fruit juice is your friend. And that’s it! You’re ready to create an awesome (and custom!) drink. Be sure to let us know when the party is! My first ever wine-buying experience wasn’t a great one. In fact, it wasn’t even a good one. Shortly after I turned 21, I went to my local liquor store and began browsing the shelves of wine waiting for something to catch my eye. I was very new to wine, so much so that I still didn’t know how to tell the differences between the grapes aside from the fact that they were either red or white. In the end, I settled on a chilled bottle of white wine that had a map of New Zealand on it. I chose it based solely on the fact that I had liked the Lord of the Rings movies and thought I might like a wine from the same country in which they were filmed. Once I tried the wine I was almost instantly disgusted. It smelled and tasted like cat urine, and it made my mouth feel strange and tingly. It was even worse than the anything-but-the-kitchen-sink punch that I was used to drinking at parties. Needless to say, I poured the bottle out and decided to stay away from anything called sauvignon blanc again. Flash forward almost nine years and my opinions have certainly changed. I’m now at a better place to understand what sauvignon blanc is all about. 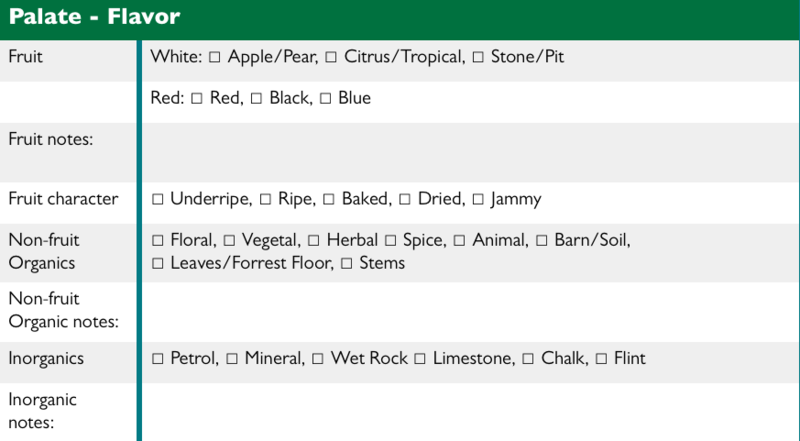 Granted, there are still a few bottles that have that “cat pee” smell, but I’m now at a better place to know what other aromas and flavors are in the wine. Likewise, I now know that tingly feeling that first bothered me was actually the wine’s natural acidity, and it’s become one of the aspects of the wine that I like most. So for those of you who have had a problem with sauvignon blanc in the past, or if you’re familiar with the grape, but haven’t tried many styles yet, this post is for you! Well, a lot, actually. Literally translated, sauvignon blanc means “savage white,” which, given the wine’s unabashed acidity, is a fitting name. Interestingly enough, sauvignon blanc once crossed with cabernet franc to produce cabernet sauvignon, hence the shared name combination. 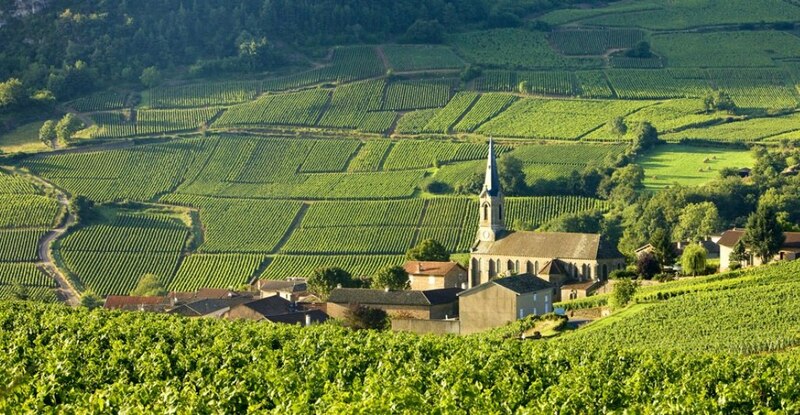 Following the French naming tradition, a sauvignon blanc wine from France will be named from the place where it was grown. 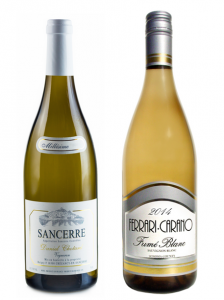 Sancerre, a village in the Loire valley is probably the most famous French sauvignon blanc, but you’ll also find them labeled as Quincy, Puilly-Fume, or Bordeaux. In the United States, you might find sauvignon blanc labeled as “Fume Blanc” which became typical in the 1970’s and 80’s when California winemakers were trying to make the grape more attractive to American consumers. More than almost any other grape variety, sauvignon blanc can take on wildly different styles based on where it’s made and grown. Here, we’ll go through the primary growing regions of sauvignon blanc and point out the biggest differences between styles. 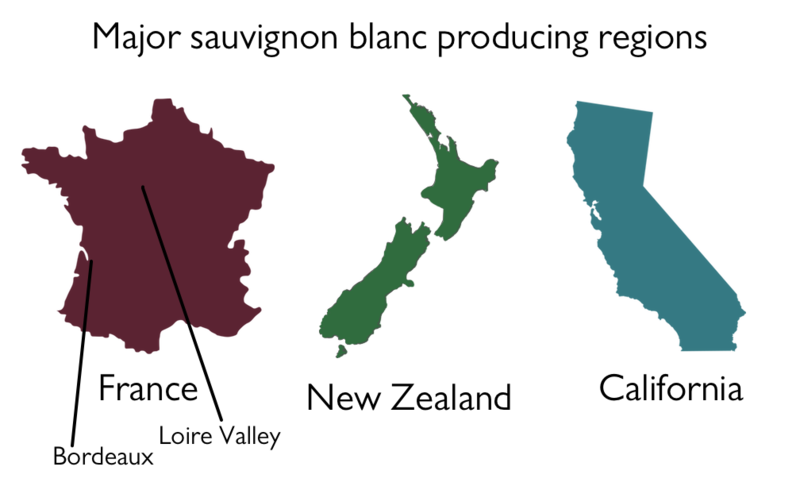 Sauvignon blanc in France comes from two primary areas: the Loire Valley and Bordeaux. The Loire Valley cuts through central France and is known for its lush white wines. Sauvignon blanc grown here is known for its strong acidity, green apple notes, and minerality. Loire Valley sauvignon blanc is almost always fermented in steel tanks. Sometimes you’ll find a Loire Valley wine that has undergone what’s referred to as “lees aging.” This gives the wine a slightly creamy texture and can add a subtle note of bread or yeast to the wine. South of the Loire Valley is Bordeaux, where the grape is blended with semillon to produce Bordeaux Blanc, or white Bordeaux. These wines are generally softer than their Loire cousins. This is achieved both through barrel fermentation and the addition of the less acidic semillon. These two factors combine to give the wines a depth and character that sets it apart from the steel tank-fermented Loire wines. In the 1980’s, sauvignon blanc decided to go on vacation and never really came back. It found a home in New Zealand that allowed it to show its true colors, and the world has been eating it up ever since. These wines retain the classic high levels of acidity but combine it were an array of tropical flavors like grapefruit or kiwi. Like in the Loire Valley, these wines are fermented in steel tanks and have a unique vegetal note (think asparagus or green beans). Sauvignon blanc in California has historically had to play second fiddle to the wines in France and New Zealand. In large part, this can be traced back to the popularity of California chardonnay, which caused growers to be reluctant to plant the less lucrative sauvignon blanc in their vineyards. A second reason is the lack of a definitive style for sauvignon blanc in California. California winemakers have chosen different paths in their winemaking, using both steel tank and barrel fermentation, barrel aging, blending with semillon, and a number of other tricks to produce markedly different wines. Sauvignon blanc’s natural acidity makes it an easy wine to pair with food. It’s ideal for any dish that contains herbs like rosemary, thyme, tarragon, basil, mint, or parsley. It’s also great for foods that are a little bit more rich in fat, such as quiche, a white sauce pizza, or hummus. It’s also great for almost any salad you could make! From now through the end of July, we’ve got select California sauvignon blancs 25% off! Stop by today and let us find the perfect wine for you. Agave is, all things considered, a weird plant. Just looking at it, spiky leaves, dangling tendrils, and long stalks, it looks like something from an alien landscape, but in actuality, it’s responsible for one of the most diverse ranges of distilled spirits on the market. Understanding these spirits can be tricky for the uninitiated. The name for the group of spirits made from agave is mezcal. 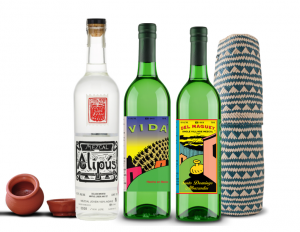 Things get confusing, however, because mezcal is also the legal definition for a group of spirits made in Oaxaca one of eight specific sites in Mexico. Similar to the way that wine is defined regionally Mexican agave-based spirits are also legally defined according to their location in a system called a Denomination of Origin (DOMs). 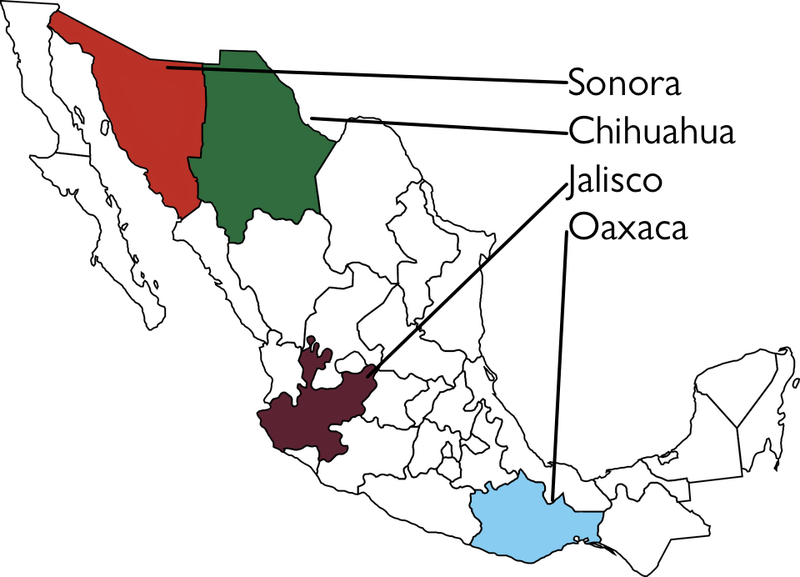 This is the legal classification that designates the eight regions where mezcal can be produced. This is also the leading difference among the remaining agave-based spirits. Tequila is the most widely known form of mezcal. Tequila can only be made from a single species of agave: the Weber Blue agave (for some, it might be helpful to think of agave species the way one thinks of grape varietals in wine). Tequila can only be made in five registered Denominations of Origin in the Mexican state of Jalisco. The production process for tequila doesn’t stray far from that of other mezcals, however, it’s important to note that not all tequilas imported into the Unites States are made from 100% agave. In order for a spirit to be labeled as tequila, it must be made from at least 51% agave, and the remaining 49% may be made from other spirits such as corn or sugar. True 100% agave tequila will always be labeled as such. Mezcal is unique in that it can be made from any species of agave. It’s typically made by baking the corazóns or “hearts” of the agave, also known as the piña, in an underground pit which gives it a smoky flavor. After this, it’s crushed and left in a barrel to ferment with water before being distilled. Most of the mezcals imported in the United States are made in the Mexican state of Oaxaca. While it can be made from any species of agave, in practice over 90% of mezcal from this region is made from the agave species called Espadin. 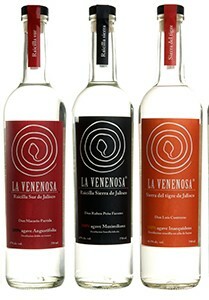 Raicilla is an agave spirit made in Jalisco but using agave species other than Blue Weber. It is less smokey than many Mezcals and often has a very unique savory almost blue cheese flavor. Bacanora is perhaps the agave spirit whose production has changed the least over the centuries. Bacanora is only derived from a wild species of mountain-growing agave called Pacifica (or traditionally Yaquiana). Once it’s been harvested, it’s cooked for two days in a pit with volcanic stones. The aroma is said to be unique because of the volcanic stones. It can only be produced in the Mexican state of Sonora. 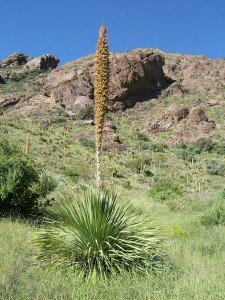 Sotol is produced from the Dasylirion wheeleri, or Desert Spoon plant. In the most technical scientific terms, this plant isn’t related to agave, but because sotol has been grouped with mezcals for centuries in Mexican culture, we’ll include it in our list. It features a towering stalk that can grow over ten feet tall. The plant can be found all over northern Mexico and the southern United States, but true sotol can only be made in the Mexican state of Chihuahua. The method of production follows that of other mezcals, with the exception that the agave heart is roasted in an above ground clay oven instead of an earthen pit. 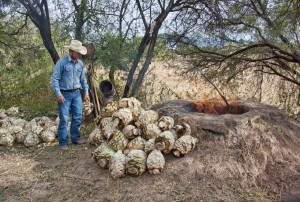 This causes sotol to lack the smoky flavors that are typically associated with other mezcals. These spirits would traditionally be sipped out of small clay cups called “copitas,” but in America, they’re often served neat or on the rocks. Additionally, they are being used extensively in craft cocktails. Most mezcals, with the exception of tequila, do not have a traditional cocktail associated with them so they give bartenders a lot of room to experiment. This is part 2 of a last week’s blog post. If you missed part 1, you can find it here. 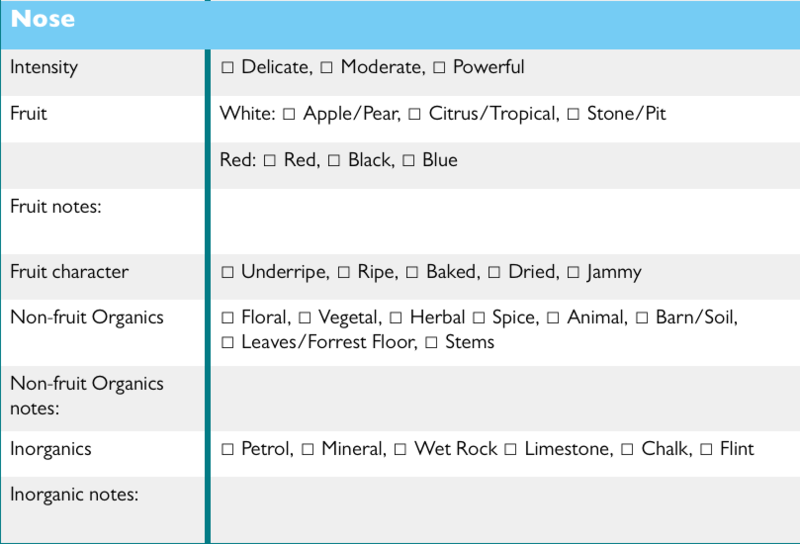 As we discussed in Part 1 of this post, sommeliers use a grid-like system to assess wine. This allows them to use a number of key indicators in order to name a wine during a blind tasting. Here we’ll walk you through a tasting guide that we’ve designed for novice tasters to get a basic understanding of the process. This first step in this entire process is to remember four letters: S N F S.
This stands for Sight, Nose, Flavor, and Structure. Personally, I remember this as “Some Noisey Flautists Smell.” I was both in band and orchestra in high school, so ‘smelly flautists’ work for me, but whatever helps you remember the steps is fine, so long as it’s an easy mnemonic device that allows me to remember the four steps to the deductive tasting process: Sight, Nose, Flavor, and Structure. Here I’ll take you through each step of the Tasting Guide using the example of Poggio alla Guardia, an Italian red wine from Tuscany. Clarity: As far as clarity of a wine is concerned, I ask myself if I can read through the wine when holding it over a page of text. In the case of Poggio alla Guardia the answer is no, but for many wines, especially white wines, you’ll have no problems making out words through the glass. Many wines will develop a slight haziness as they age. This is normal and a clue to the wines age. Color: On the Tasting Guide, there are lines for both red and white wines, but for my Italian red blend, only the red line is needed and it’s a decidedly garnet shade. Rim variation: This concerns the change in color of the wine from the center of the glass to its outer edge. Some wines, especially older wines, will have a drastic change in color, but most young wines (maybe under 4 years old) will have very little if any change. Here, my wine is 2011 has no rim variation. Legs: Legs, sometimes called tears, are the way the wine slides down a glass after being swirled. Sometimes, you’ll notice that the wine begins to fall down the glass immediately, other times you’ll notice that will stay in place for several seconds before it falls. A general rule of thumb is that a wine with shorter legs (one that falls faster) will have either less alcohol and less sugar than a wine with longer legs. My glass today has medium legs. Here we smell the wine. Give it a good swirl and you’ll be ready to go! Intensity: Right off the bat, as soon as I opened this bottle, I could smell and intense aroma of graphite, violets, and cherries. The farther you can smell a wine from your glass, the more intense it is. 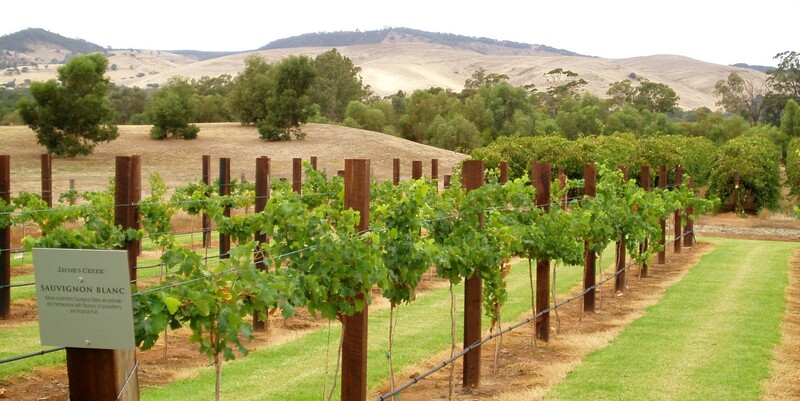 Fruit: This is another field for which we have different lines for red and white wines. Red fruits, especially cherries and black cherries are dominating my glass. In a white wine, I would expect more apple and citrus aromas. Fruit Character: The cherries here are abundant, but they definitely don’t smell fresh. I’d almost say they smelled just a little bit like the cherry jam I like on my toast in the mornings. Though the difference between under ripe and jammy fruit may seem small, when you smell or taste it in a wine, the difference become immediately noticeable. Non-fruit Organics: Now this is always a tricky category – everyone’s palate is different and everyone picks up on something different. For my Italian red, I’m getting a very pronounced smell of violets (one of my favorite red wine smells! ), and also a nice note of spiciness – some clove a white pepper. You’re halfway through, and you finally get to taste your wine! Fruit: Again, flavor is quite self-explanatory, it’s simply the flavors you find in the wine. On the palate I can taste, the black and red cherries are still there and they’re delicious! Fruit character: Character describes the fruits we taste. Just like with the aroma, the cherries I’m tasting are quite jammy. 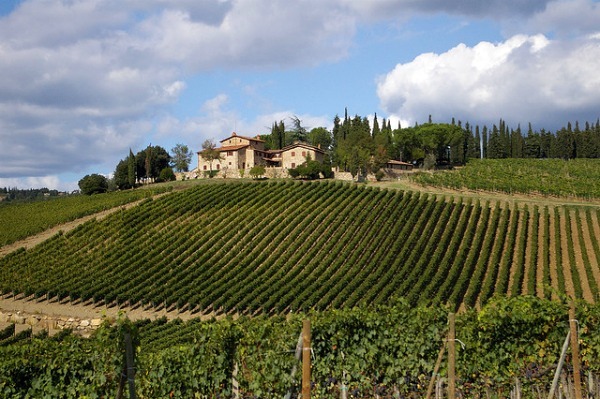 Typically, wines with jammy fruit come from hot climates, and this wine came from scorching-hot Central Italy. Non-fruit Organics: The violets I smelled earlier are really overwhelmed on the palate by notes of pepper, clove, and a really woodsy cedar note. Inorganics: Like I said before, I’m getting a definite note of pencil shavings – it’s giving me a flashback to fourth grade! Sweetness: Wines can be made to varying degrees of sweetness, though most of them tend to fall in the range of Bone Dry (no sugar at all), to Off Dry, which is a barely perceptible amount of sugar. My wine today is a totally dry wine. Tannin: This is that hard-to-describe aspect of wine that sometimes comes off as bitterness. It’s also what can make your mouth pucker after taking a drink of a wine. I’m rating my wine as High. This is a blend of merlot, cabernet sauvignon, and sangiovese, three grapes with high tannins. Acid: I tend to feel acid in the back of my mouth, in the part of my mouth that tends to clench itself when I’m tasting something sour. My wine has low acidity. Another way to test acidity is to take a sip and see if it makes your mouth water. High acid wines do this while low acid ones will leave your mouth a bit dry. Alcohol: I can definitely feel the burn of alcohol when I swallow, which tells me this wine has high alcohol. I check the bottle and it’s confirmed: 14.5%. Body: An easy way to think about the body of a wine is to compare it to milk. Is the wine I’m drinking closer to whole milk, 2% or skim? Obviously, a skim milk-like wine is lighter bodied than a fuller-bodied, whole milk-like wine. My wine is decidedly full-bodied. Texture: Texture describes the way the liquid feels in your mouth. Some wines can feel very lean, almost like water, while others, especially those that have been aged in oak often take on a creamy character. My wine tonight doesn’t fit into either of those categories and instead gives off a nice round texture. Balance: Balance is asking if all aspects of a wine, the nose and palate, work together. Are there any single notes that awkwardly stick out? For my wine, though the aroma and taste of cherries are both strong, they’re held in balance by the rest of the wine’s aromas and flavors. Length/Finish: I like to think of this as the length it takes for any trace of the wine to disappear from my palate. This will vary depending upon the kind of wine you’re drinking, but my wine today has quite a long finish. 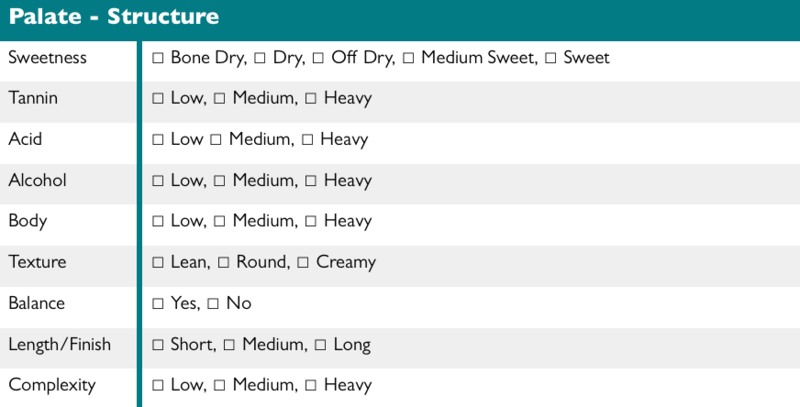 Our Tasting Guide is by no mean comprehensive, but it’s a perfect way to broaden your own knowledge base. You can download a printable PDF of our Tasting Guide by clicking the link below. Think you know a lot about alcohol? See if you which of these alcohol-related “facts” are actually fiction! The issue here is not a change in temperature, but the change in the presence of light. Beer is extremely susceptible to damage by light that give it a “skunky” taste. This is the reason that most beers come in brown bottles or in cans. Many beers that come in green or clear bottles, like Heineken or Corona, are intentionally creating that flavor, and in the case of Corona, the lime is suggested to further augment this flavor. This is true for all carbonated drinks, including beer and cocktails made with tonics or other carbonated mixers. Scientist have proven that those consuming carbonated beverages absorb alcohol more quickly, but they’re not sure why. One theory is carbonation increases the air pressure in the stomach which forces the alcohol into your bloodstream at a faster rate than wine or other mixed drinks. 3) has to be aged in new charred oak barrels. Bourbon can be made in any state at any time. Though there was a harmful, seizure-inducing chemical called thujone in some early forms of absinthe, there have never been any hallucinogens in this drink. Much of absinthe’s bad reputation comes from French winemakers whose wine had lost market share to the much cheaper absinthe. They launched a smear campaign that eventually led to the drink being banned in much of Europe and the United States. As of 2007, however, absinthe is now legal so long as it contains only trace elements of thujone. Interestingly enough, most absinthe makers agree that one would need to consume about 300,000 gallons (about half an Olympic sized pool) of absinthe to be affected by thujone. Though wine is made only of grapes, many animal products, including egg whites, bone marrow, and fish bladders are often used in a winemaking process called “fining.” This process removes elements that would otherwise make the wine seem cloudy. Though the animal parts are always removed before bottling, this precludes the wine from being labeled as vegan. There are, however, several vegan wineries who don’t use animal products in the fining process and plenty of unfined wines available. I am so thrilled to finally share this wine with you. It has taken several months to finally have it delivered. The Musar winery is one of my favorite in the entire world. They make some of the most beautiful, complex, and unique wines in the whole world. 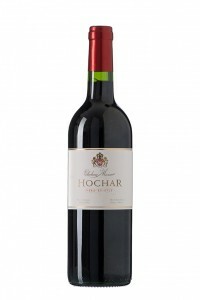 The”Hochar” is named for the family that owns Chateau Musar. This is their “second wine” which is designed to be more approachable young. It is composed of 50% cinsault, 30% Grenache, 10% Cabernet Sauvignon, and 10% carignan. When the wine is first opened the aroma is dominated by rich cedar and spice. As it is allowed to breathe more and more complex notes of leather, cigar, graphite, blackberry compote, dried plums, dates, lavender, and anis are reviled. On the pallet the tannin is quite pronounced and slightly rustic. The fruit is fresher and tarter on the pallet with a distinct dusty texture. The finish is persistent and drying. An excellent wine to pare with roasted lamb or barbecue. I highly recommend decanting the wine ahead of time and tasting how it evolves over the course of a meal. It’s too hot to drink anything that isn’t cold, so it’s no wonder that all of this month’s staff picks are best enjoyed chilled! I think this might be my new favorite rosé! It’s a blend of syrah, zinfandel, cabernet sauvignon, cabernet franc, merlot, and, of all things, sauvignon blanc. It is dry but bursts in the glass with notes of red and citrus fruit, and a hint of that sauvignon blanc crispness that take this rosé in a whole new direction. I’ve been drinking it all summer long and I’m yet to find something that it doesn’t pair with. Only 224 cases were ever produced, and you can bet that I’ll be in the hunt for every last bottle I can find. Picpoul is a grape grown widely in the Languedoc region of southern France. Its hallmarks are flavors of lime and a focused acidity. These flavors are complemented by a slightly floral note and balanced minerality. This refreshing summer white is a perfect match for fresh seafood and shellfish. Citrus and tropical fruits are backed by characteristic herbaceous notes of Marlborough sauvignon blanc. It’s brimming with juicy acidity and fruity sweetness, providing a balanced flavor profile. The finish is fresh, zesty, and long lasting. This drier style of riesling evokes an orchard in summertime: freshly cut hay, green pear, Meyer lemon, and orange blossoms. A weighty palate of ruby red grapefruit, ginger, and sour candy follows with a lingering citrus finish. Elegant and lively, this wine displays a complex and alluring nose of lychee, orange blossom, peach, apricot, lemongrass and white pepper. On the palate, excellent acidity adds precision to vibrant notes of fresh citrus and minerality that carry through to a crisp, focused finish. Prairie Artisan Ales from Krebs, Oklahoma has established themselves as one of the most experimental breweries in the craft beer scene. 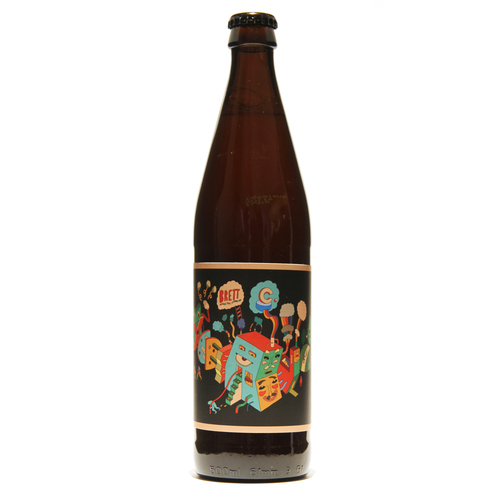 Prairie Artisan Ales’ brews don’t fit the mold of “typical” and the Brett C is no exception. Who is “Brett” you might ask? Brett refers to Brettanomyces, a type of wild yeast that gives beer and wine a funky and interesting aroma and flavor. The beer pours a hazy straw yellow with a lively white head and fine lacing. The aroma is citrusy and grassy with a slight savory note and a pleasant Brett aroma. Taste is bright and slightly hoppy with a lingering finish which I love. If you like a saison or farmhouse ale this beer is sure to hit that note in a new and unique way. If you’re like me, you don’t always finish every bottle of wine that you open- you end up recorking it and sticking it the fridge. More often than not, these bottles end up as ingredients in the next night’s dinner. Adding wine to a dish can add a host of new flavors. Adding wine is the perfect way to turn a simple weeknight meal into something special. The key when cooking with wine is to only use a bottle of quality wine. This doesn’t mean that you should go out and spend your whole paycheck on bottle of wine just to pour it into your spaghetti sauce, but it does mean that you should get a wine that you’d be happy drinking on its own. Remember, whatever wine you use will end up dramatically affecting the dish, so it’s best to choose something you enjoy. If I don’t have any partial bottles to use, I’ll serve whatever is left over from cooking to pair with the dish. Wine can be added to many dishes, but knowing when to add the wine can be a little tricky. You should treat wine much like you would any other spice or herb, in that too much of it won’t be noticeable, but too much could ruin a dish. You’ll want to add the wine before or during the actual cooking time. Adding it too late in the process doesn’t allow the alcohol to cook off and can your entire dish a harsh taste. For most recipes, you’ll only want about ¼ of a cup. When it comes to choosing which wine to add to a specific dish, the combinations are almost endless. As a rule of thumb, I generally pair red wines with red meat and tomato based dishes, while using white wines for vegetables and seafood. It’s also a safe bet to use wines in dishes that are from the same region. For example, an Italian sangiovese would be excellent in a hearty pasta dish. Slice the onion and place it on the bottom of a large pan. Rub the salmon with salt and pepper, then place on the onion skin side down, then sprinkle with dill. Slice one of the lemons into wheels and lay over the salmon. Cut the second lemon into halves, and drizzle the juice of one half over the salmon. Fill the pan with 1 bottle of white wine, if the salmon is not covered, top off with water. Turn on the heat until boiling, and then remove from heat. Cover the pan and let rest for 15 minutes. Drizzle the juice of the second lemon half over the fish once it’s plated. For this recipe, I’ve used a number of white wines. 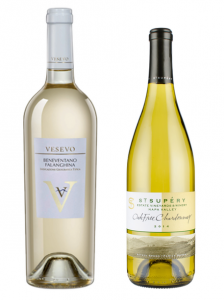 I’ve found that an Italian falanghina, such as the Vesevo Beneventano falanghina tastes best to me, but I think an unoaked chardonnay gives the fish an added zest that I really enjoy. St. Supéry’s unoaked chardonnay is one I use all the time. Cut the fennel bulbs into wedges and let them cook in the olive oil over medium heat for 2-3 minutes until they begin to caramelize. Stir and let them cook through for another 2-3 minutes. Then add the lemon wedges, salt, honey, and wine*, stirring to combine. Let the wine reduce for 1-2 minutes before adding in the beans. Stir again and let cook for 5 minutes before serving. Add dill and olive oil for garnish. I think sauvignon blanc works best here. A good French Sancerre will add a racy, tangy element to the honey and fennel, but it might be overpowering for some palates. When I choose to use a Sancerre, I always use one from Daniel Chotard. I’ve found that a well-oaked sauvignon blanc from California, such as Ferrari Carano’s fumé blanc seems to work for my guests. The oak cuts down the wine’s natural acidity and adds a tiny hint of vanilla to the dish’s natural flavor. This is my favorite way to punch up a pasta dish, especially on a busy weeknight when I haven’t had the time (or energy) to make my own sauce. You can even purchase store-bought meatballs for this so long as they aren’t already cooked. Take your uncooked meatballs and place them into a saucepan and fill it with wine so that the meatballs a quarter to half submerged. The amount of wine needed will vary. Simmer in the wine for about 10 minutes and then add your sauce to the pan to continue simmering until ready, usually about 25-30 minutes. You can literally use any wine you want for this recipe. I’ve used cabernet sauvignon, sangiovese, and syrah and it’s come out different and delicious each time. 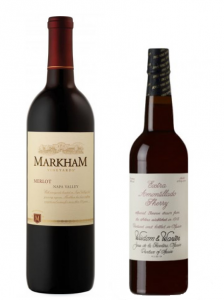 I seem to always have a bottle of merlot on hand, especially Markham merlot, so it gets used most often. My personal favorite combination is a chorizo meatball simmered in Wisdom & Water Extra Amontillado sherry along with my own personal sauce recipe, but this recipe is so easy that you can do literally anything to it and come out with an excellent dinner.